I’ve never seen my kids so excited about making a recipe with me. There is something magical about Jello, don’t you think? It was my comfort food while in labor with my daughter. Last summer I was on a kick and made myself lime Jello with cherries floating in it but this is the first time I made it this year. 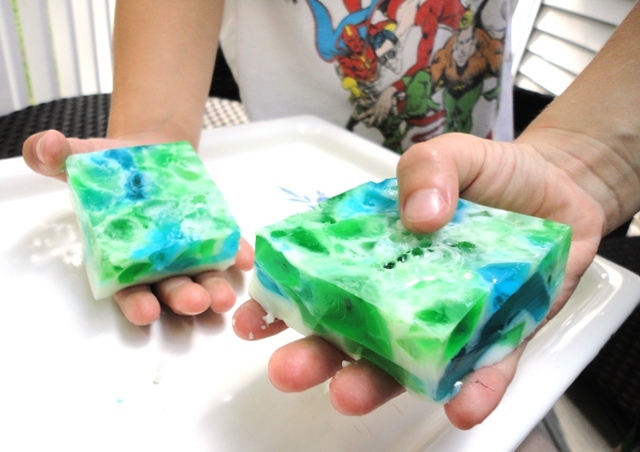 I was inspired to make this recipe by Recipe Girl’s version of Sea Glass Jello and because our favorite thing to do at the beach while on vacation in Nova Scotia besides play in the water is to search for sea glass. That’s a photo of some of my collection on the right. While I was preparing to write this post I decided to pull out the bucket of sea glass that I’ve amassed over the years. I was flabbergasted at how much I’ve actually collected. I even signed up for the North American Sea Glass Association today so I would receive their newsletter about sea glass. I was also thrilled to find out that the 2010 Sea Glass Festival is in Massachusetts and I hope to attend. Sometimes I am torn about searching for sea glass. 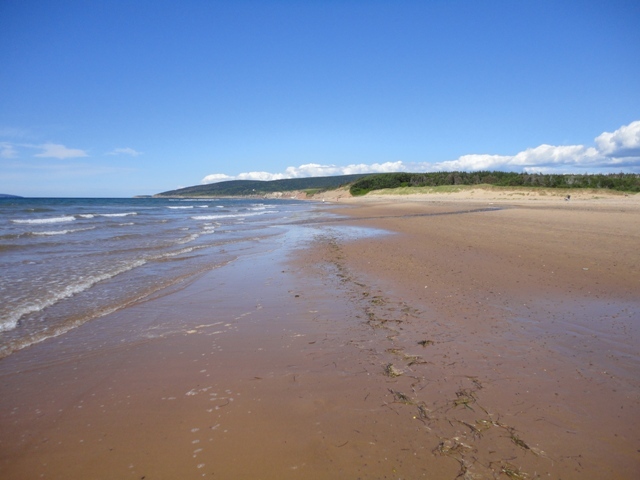 We find the most at a gorgeous beach in Inverness, Nova Scotia and I feel that I should be appreciating the beauty of the landscape instead of walking head down along the water looking for the next beautiful shard of glass. This year I tried to keep that in mind during our afternoon at the beach. You can’t keep your head down long with two kids playing in the surf. This year my husband got into the game and he walked a large portion of the beach looking for that elusive piece of red glass. He even tricked his mom with a piece of red plastic that he found. Oh how she wished it were glass. He even started getting picky about what colors he would pick up. I picked up whatever I can find and especially like shards of pottery worn smooth by the ocean. Inverness Beach is my favorite beach in the world. Every direction you look is more beautiful. So today I also put my collection of sea glass on display. It shouldn’t be hidden in a bucket in the basement when a bowl full of sea glass is a beautiful display and conversation piece in the home. The most common color is frosted white glass, next being green and then brown. My mother-in-law favors blue sea glass and she seems to find it more than anyone. Maybe you’ve just got to get your sea glass “eyes” on much in the way you would hunt for morels. 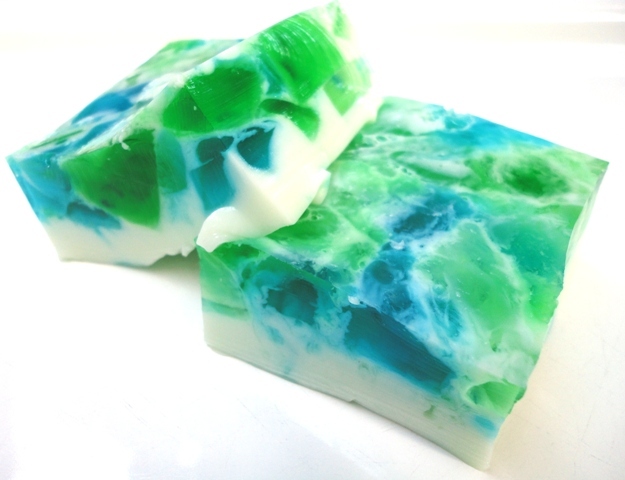 For this recipe I chose berry blue, lime, and melon fusion flavors to match the colors in my collection. This is a very kid friendly recipe. My daughter helped stir up the Jello. Both kids cut it up once gelled and mixed up the colors. Once it was complete and I needed taste testers the kids jumped around the kitchen to try it. Then they followed me outside while I took photos of the final result. They wanted to eat those too. I’ve made rainbow Jello several years for Christmas but my daughter has requested this recipe instead. I have to agree with her because it is 100 times easier than making seven layers of Jello. 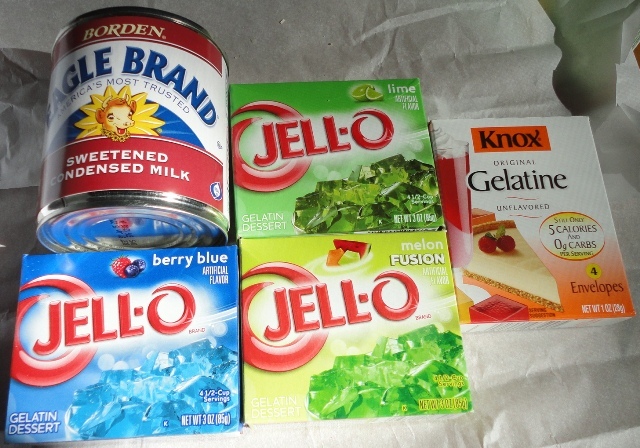 Prepare the Jello using only 1 cup of hot water in three separate containers. Chill for 4 hours until the Jello has set up. Cut the Jello into cubes and place in a 13×9 glass pan. 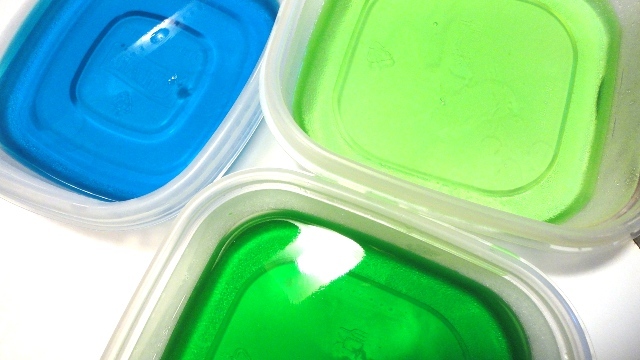 Keep Jello cubes in the refrigerator until ready to add the white layer. In a separate bowl mix the 2 envelopes of unflavored gelatin with 1/2 cup cold water. Add 1 1/2 cups of boiling water and stir until dissolved. Mix in the sweetened condensed milk. 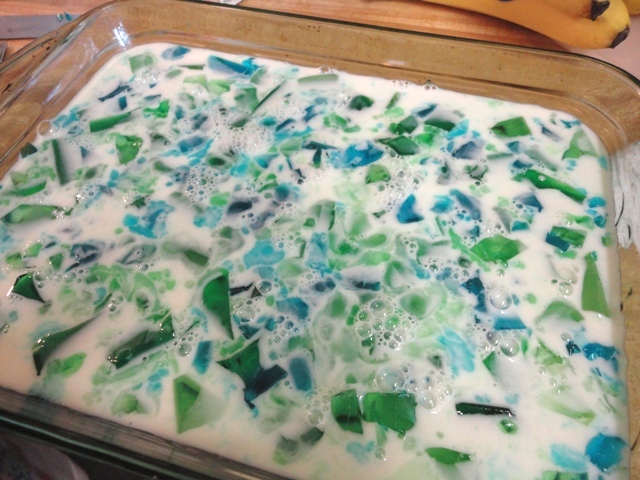 Allow the milk mixture to cool and then pour over the Jello cubes. Chill for 4 hours or overnight. The beauty of this recipe is not just the combination of the colors but that it can be sliced into squares and eaten out of your hand. The kids especially liked that. We’re already planning the color combinations for future batches of this beautiful treat. 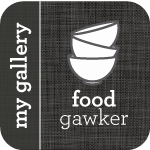 dessert, recipe, Recipes, Tried It! Great idea! It looks beautiful. I got a wonderful pair of sea glass earrings and necklace for my birthday this year. The strangest thing though – it changes color depending on whether I’m indoors or out. Inside it is blue, outside it is purple. Strangest thing. Ever heard of it doing that before? You should see about making some jewelry out of your collection! I have thought of several art projects for my sea glass but haven’t been motivated to act just yet. I’ve even thought about selling it. I find that the search is more fun than possessing it. Wow, this looks so neat. 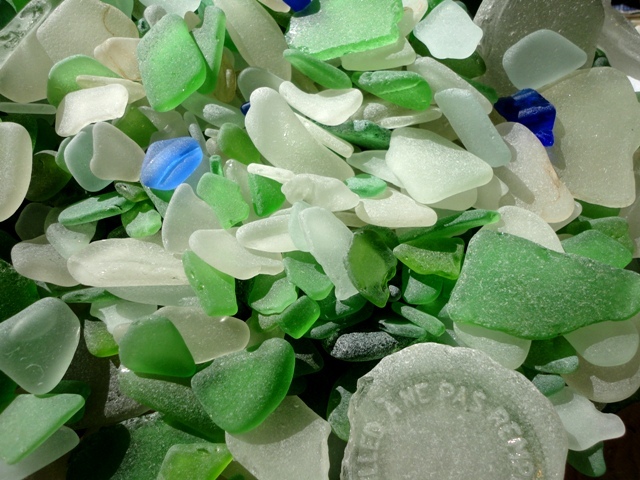 Sea glass is made from bottles that have been thrown into the ocean. It breaks up and then is weathered by the salt water and smoothed by the sand and rocks. It’s more rare these days because people are recycling more and not disposing of trash in the ocean as much. It is fun… very much like hunting for treasure. Oh, it turned out great! I can see why the kids enjoyed it so much. What a great idea! 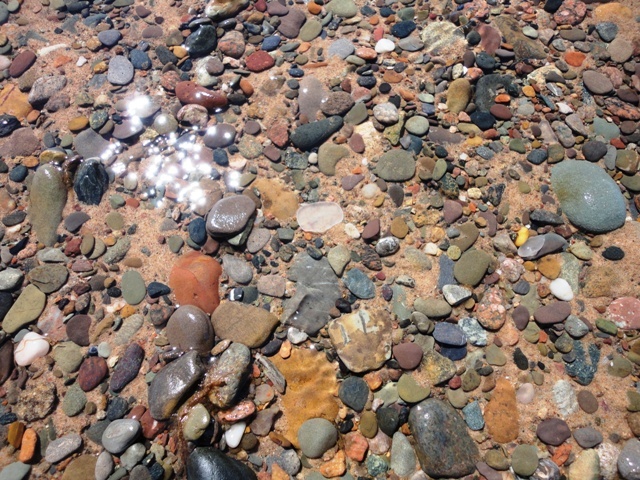 Your kids are right…it does look just like sea glass! Thanks for the neat recipe! Great idea about using coconut milk! Thanks. So, so, so cool! Can’t wait to try it with my kids this weekend!